If you haven’t had the chilli cheese fries and the delectable Chef’s Secret Burger at Sankys Burger House you really can’t say you are a burger aficionado. 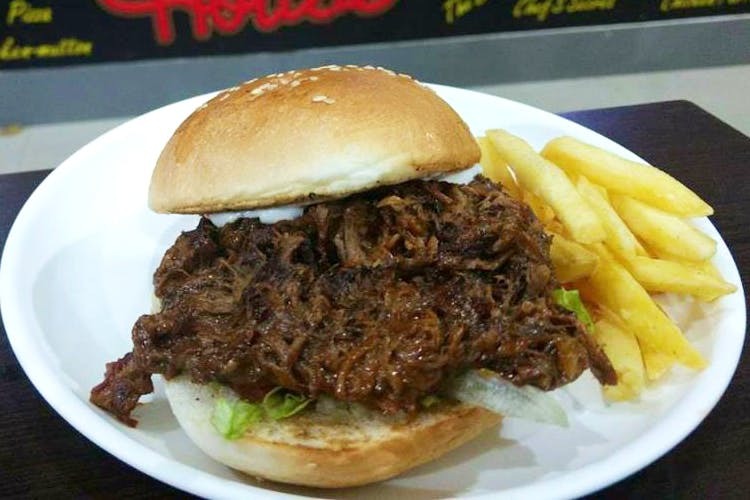 Sankys Burger House, which is in Lingarajapuram, has been whipping up some mouth watering food like their chilli cheese fries, burgers and shakes that are delicious and satisfying. They have delectable starters as well like their Chicken Cheese Balls which is basically oodles of cheese and lightly spiced meat that is deep fried, which makes for the perfect comfort food. This is for all the burger lovers and cheese lovers out there. If you crave for good food at reasonable prices, this place is a good bet. It’s a quaint place with wooden chairs and tables. The walls are covered with some rather interesting artwork. The host and owner Sankreeth, popularly known as Sanky, will help you with ordering the meal by taking into consideration your tastes and preferences and recommending something that you’re likely to enjoy. You must start off with the cheese fries which is basically fries drenched in cheese and is a great vegetarian option. For the non-vegetarians out there, the chilli cheese fries, which comes with good amounts of cheese and meat, is the starter for you. The Paneer Burgers are my top vegetarian pick and the Chef’s Secret is my non-vegetarian recommendation. Wash it all down with their super satisfying shakes, available in flavours like Oreo and Chocolate Peanut that come for a cool INR 50. Brilliant food in terms of taste, quantity and quality. I pretty much head down there every week for great grub and good service.